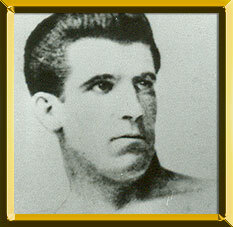 A NEW BREED of boxer was born when James J. Corbett won the heavyweight title from John L. Sullivan in 1892. Corbett was an educated man who practiced the science of boxing. He broke the mold of the stereotypical brawling prizefighter. Corbett was born on September 1, 1866 in San Francisco. He was raised in a middle class home, attended college and even worked as a bank clerk. He learned his boxing not on the streets but in sparring clubs. He learned how to box under the guidance of Walter Watson at San Francisco's Olympic Club. Because of his handsome appearance and classy ring style, he earned such nicknames as Handsome Jim, Pompadour Jim and finally, Gentleman Jim. Corbett's first pro fight came when he was 18 and he knocked out Frank Smith. Gentleman Jim's career took off, however, with a three-fight series against fellow Hall of Famer Joe Choynski. They met three times in a three month span in 1889. The first bout was a no contest after four rounds. Corbett won the second with a 27th-round knockout and the third with a four-round decision. The first fight was interrupted by police, but the middle bout, contested six days later, was an epic contest fought on a barge in San Francisco Bay. The seems from Choynski's gloves cut Corbett in round three. And later in the fight Corbett broke his left hand. Yet, he managed to summon enough power to knockout Choynski with a left hook. The next year he won a four-round decision over respected heavyweight Jake Kilrain. Then in 1891 he fought a 61-round battle with fellow hall-of-famer Peter Jackson, which was ruled a no contest. A month after that bout, Corbett boxed a four-round exhibition with John L. Sullivan, giving him a preview of things to come. The much anticipated Sullivan-Corbett fight took place on September 7, 1892 in New Orleans. It was the first heavyweight championship bout in which the participants wore gloves. Corbett, with Prof. Mike Donovan in his corner, boxed brilliantly. He countered sharply and managed to sidestep Sullivan's bullish charges. In the 21st round, Sullivan was exhausted and Corbett pounded the champion into submission, knocking him out with a right hand. In 1894, Corbett successfully defended the title with a third-round knockout over Charley Mitchell. He would lose the crown in his next defense as Bob Fitzsimmons kayoed him in the 14th round in 1897. In 1900, Corbett challenged heavyweight king James J. Jeffries -- who was his former sparring partner -- and was knocked out in the 23rd round. They fought a rematch in 1903 and this time Jeffries scored a 10th-round kayo. In between the two Jeffries fights, Corbett knocked out middleweight champion Charles "Kid" McCoy in the fifth round. Corbett performed on the stage during his reign as heavyweight champion and continued his acting career well into his retirement.